Devotion (Bhakti) is the mother of Knowledge (or Jnana). Without Devotion, there is no Knowledge. Devotion is the highest path. "To remain without thought in the waking state is the greatest worship." Listen to descriptions of the nine types of devotion. This alone is purifying. Listen to discourses about non-duality and liberation. Listen to explanations of the paths: the path of action or spiritual practice (karma or sadhana), the path of knowledge (jnana), the path of conclusive truth (siddhanta), the path of union (yoga) and the path of desirelessness (vairagya). Find out the essence of them all. Listen to teachings about mantras, meditation techniques, postures (asanas), signs & gestures (mudras), energy (shakti) and the various initiations; also, the divine arts & sciences of healing, herbs, gems, astrology, palmistry and the like. Devotion through listening entails obtaining the True and discarding the false through understanding. The entire world is your field for propagating the greatness of Atman or the Self. Compassion and tears of love flow when chanting God's names and inspiration and virtue and joy fill the space. Remember the Sadguru morning, afternoon, evening and night. Remember "I am Brahman"; "I am Shiva"; "I am Rama" constantly. The heart in which Devotion to God is constant is the moving, living temple. Whether in a state of happiness or distress; whether walking, sitting, eating, working or resting; whether beginning a new endeavor or dying, always remember God. It is the True Master or Sadguru who shows the Reality; who teaches what cannot be learned by study nor attained by practice. Non-attachment (giving up the sense of "me" or "mine"), surrender, being beyond the body, being beyond the mind and being in a natural state of no-mind, alone, are all attained only by the blessing of the Guru. Serve the guru with body and speech and mind. With crystals and incense and plants and flowers, make and maintain a temple. Chant the Gayatri Mantra. Worship idols or images of Ganesh or Krishna or Shiva. Everything is God's. Offer all wants to God. By bowing down, blemishes in our character go away, blessings are given, and the Guru is pleased. By bowing, you gain humility and happiness. When seeing extraordinary qualities in someone, know that the Sadguru is residing in those qualities and bow to that person with great respect. Bow down to the Sun and to God and to the Sadguru with complete surrender. The alternative is to suffer. Serve the One Self with enthusiasm, enjoyment & pleasure. Do what you are called to do. Rebuild dilapidated temples, make healthy and strong the bodies and minds of fellow devotees and always increase the glory of God. Cherish the magnificence of the one God who is all. Intimately and creatively commune with Atman. Bind yourself to the Sadguru by your deep love. Behave always in a way which is loved by the Self. Like what the Sadguru likes and let the Sadguru do what the Sadguru likes. This is the opportunity for you to free yourself. Give up your worry and take care of your guru; then, the Sadguru will surely take care of you. Maintain the sense of connectedness and offer your entire life to God. The state of non-duality comes naturally. There is no “I” and the Self is without attributes; alone, without distinctions. Only Brahman Is. Even the witness does not remain. Only the Self exists in the beginning and in the end, so how can there be any independently existing “I”? Make your spiritual practice intense. Leave off all wrong thinking and allow your Devotion to be all consuming. To hold dear to your heart the image of your Sadguru at all times is the practice of the State of Purity; That, which is always clean, always sacred, and always pure; the most powerful, indestructible, and deathless True Nature (Swaroopa) of the Sadguru. Not to forget this, is itself, spiritual practice. "Compassion is the foundation of earnestness. 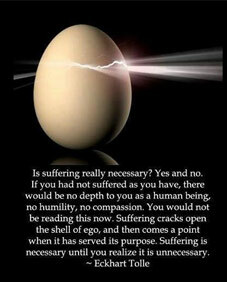 Compassion for yourself and others, born of suffering, your own and others". Having gone beyond the mind-made opposites, you become like a deep lake. The outer situation of your life and whatever happens there, is the surface of the lake. Sometimes calm, sometimes windy and rough, according to the cycles and seasons. Deep down, however, the lake is always undisturbed. You are the whole lake, not just the surface, and you are in touch with your own depth, which remains absolutely still. You don't resist change by mentally clinging to any situation. Your inner peace does not depend on it. You abide in Being - unchanging, timeless, deathless - and you are no longer dependent for fulfillment or happiness on the outer world of constantly fluctuating forms. You can enjoy them, play with them, create new forms, appreciate the beauty of it all. But there will be no need to attach yourself to any of it. When you become this detached, does it not mean that you also become remote from other human beings? On the contrary. As long as you are unaware of Being, the reality of other humans will elude you, because you have not found your own. Your mind will like or dislike their form, which is not just their body but includes their mind as well. True relationship becomes possible only when there is an awareness of Being. Coming from Being, you will perceive another person's body and mind as just a screen, as it were, behind which you can feel their true reality, as you feel yours. So, when confronted with someone else's suffering or unconscious behavior, you stay present and in touch with Being and are thus able to look beyond the form and feel the other person's radiant and pure Being through your own. At the level of Being, all suffering is recognized as an illusion. Suffering is due to identification with form. Miracles of healing sometimes occur through this realization, by awakening Being-consciousness in others - if they are ready. Is that what compassion is? Yes. Compassion is the awareness of a deep bond between yourself and all creatures. But there are two sides to compassion, two sides to this bond. On the one hand, since you are still here as a physical body, you share the vulnerability and mortality of your physical form with every other human and with every living being. Next time you say "I have nothing in common with this person," remember that you have a great deal in common: A few years from now - two years or seventy years, it doesn't make much difference - both of you will have become rotting corpses, then piles of dust, then nothing at all. This is a sobering and humbling realization that leaves little room for pride. Is this a negative thought? No, it is a fact. Why close your eyes to it? In that sense, there is total equality between you and every other creature. The realization of this deathless dimension, your true nature, is the other side of compassion. On a deep feeling-level, you now recognize not only your own immortality but through your own that of every other creature as well. On the level of form, you share mortality and the precariousness of existence. On the level of Being, you share eternal, radiant life. These are the two aspects of compassion. In com-passion, the seemingly opposite feelings of sadness and joy merge into one and become transmuted into a deep inner peace. This is the peace of God. It is one of the most noble feelings that humans are capable of, and it has great healing and transformative power. But true compassion, as I have just described it, is as yet rare. To have deep empathy for the suffering of another being certainly requires a high degree of consciousness but represents only one side of compassion. It is not complete. True compassion goes beyond empathy or sympathy. It does not happen until sadness merges with joy, the joy of Being beyond form, the joy of eternal life. ◊ Green Beautiful - "La Belle Verte"